C.F. Møller and C.F. 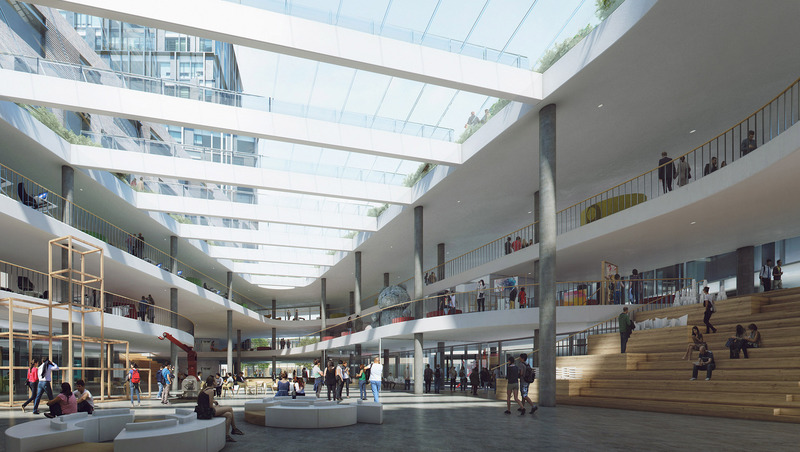 Møller Landscape’s proposal for the new VIA University (30,000 m²) and the Innovation House (5,000 m²) has been nominated as the winner of a major architectural competition. This is the wording of the adjudicators’ report on the recently completed architectural competition for a large element of Campus Horsens. The new VIA University College and Innovation House, comprising 35,000 m² in total, will together constitute close to half of the new combined campus area in Horsens, which CASA A/S in 2015 won the right to develop, with Horsens Municipality as the client. The new VIA and Innovation House will be built at Horsens’ railway station and the overall area will be called Campus Horsens. C.F. Møller’s winning project was chosen by a panel of jury experts, educational institutions, Horsens Municipality and Casa. A key idea in C.F. Møller and C.F. Møller Landscape’s overall project for VIA is to create a venue that meets the city, and which opens up to society with an active, youthful energy flow. There was a wish to create a campus that is an image of how a modern, knowledge-based society should be formed in the future – as a venue that is wise, open, in close proximity, creative, heterogeneous, individual, and with a strong bond to the city and society. “VIA and Innovation House are establishing a vibrant built-up environment that in a varied design idiom – and with great diversity – will invite us inside, calling on us to combine and relate knowledge and ideas across the board, and to open up and reach out,” is how Michael Kruse describes the project. “It stands as a combination of individual building sections, each with its own identity, and as one overall college with a high degree of flexibility and great spatial and content-based diversity. VIA and the Innovation House are built up according to the clear aim of establishing a robust construction concept that due to its simplicity and rational design can be achieved within the economic framework and ensure that the college – with its great flexibility – can adapt to future changes and programme adjustments, without undermining its architectural qualities,” Michael Kruse says. All the lads here in Beauty and The Bit feel glad about this new win in our trajectory.